The ability to create and sustain fire is an essential safety requirement in a survival situation. Fire provides warmth when environmental conditions cause body heat to start dropping below safe limits. Fire provides the ability to sterilize food and items for safer consumption and use. Fire also provides some levels of safety at night from wild animals or ability signal one’s location. The ability to create fire has served as one of the core differentiators between humans and the rest of the animal kingdom as well as essential to the development of mankind’s modern era. I wanted to ensure that for my bug out bag (BOB) my ability to generate fire could be accomplished via multiple and variable ways. I also wanted to ensure that the BOB had fire generation capabilities ranging from immediate emergency, worst case need to long term sustainment. The two largest factors that influence these capabilities are moisture and wind. Both of which in excessive quantities can be detrimental to being able to generate and sustain a good fire. Consequently, two key legs of the fire triangle, fire and fuel, become critical needs for a good BOB plan. Making a fire is as much art as it is science. There are a plethora of ways to make fire. They key is finding the way that is most successful for you and the situation – which requires trial and practice. This is why I have such a range of items to generate fire. Also, fuel sources are generally plentiful and many. I paired down the list to just what I thought best to pack, with the expectation that majority of combustible material could be scavenged. Stormproof Match Kit; 25 matches and 3 strikers in weather proof case. You can also buy or make (1 or 2) waterproof matches and store in a container. FireSteel Armageddon by Firesteel.com; around 12K ignitions – with the right fuel. I would recommend watching a firesteel evaluation video by JungleCrafty. Bow Drill; ignitions as long as cord is functional – the components can be scavenged, but recommend packing some multiuse paracord. 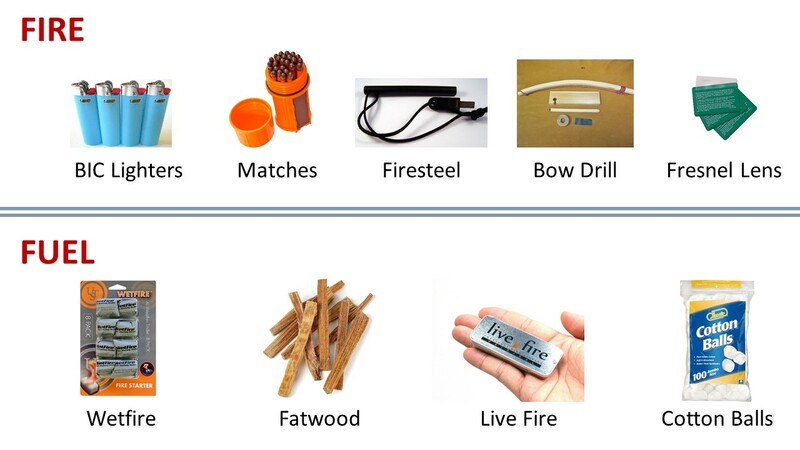 Fire bow and fire drill kits for practice or packing can be purchased from Amazon. I would recommend watching Andy’s bow drill guide over at InnerBark Outdoors. Fresnel Lens; infinite ignitions with full noon-day sun, does not work in suboptimal light or darkness. To learn more, watch an overview video from Reality Survival. WetFire; lights and burns even in water. Fatwood; great for making shavings and starting a fire when time is of the essence or tinder availability is low. Cotton balls; multiuse item, can control rate of burn if covered with petroleum jelly, which is another multiuse item. You can take it a couple steps further and make tinder almost like WetFire using cotton balls, petroleum jelly, and wax. Read Erich’s how-to post at Tactical Intelligence.